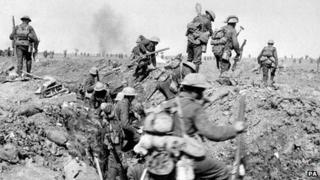 Key observance dates have been announced for World War I centenary commemorations in Scotland. The milestones of the conflict being marked by public events include major military battles. The programme was outlined by First Minister Alex Salmond, speaking at the annual conference of the Royal British Legion Scotland (RBLS). The dates were chosen by the Scottish Commemorations Panel, chaired by the former army chaplain Norman Drummond. Mr Salmond told the conference: "Next year and throughout the following five years, people in communities across Scotland will gather together and remember the exceptional sacrifice made by their sons during the brutal conflicts of the Great War. "The Great War commemorations are in no sense a celebration of the centenary of this devastating conflict. "They are a commemoration, which will give the whole of the country the opportunity to reflect on the impact that the First World War had on Scotland during a programme of significant dates I am outlining today." The dates chosen include those of key land battles at Loos and Arras, the naval battle of Jutland, and the train crash at Quintinshill, near Gretna, which killed 214 servicemen. The loss of HMS Iolaire, which was carrying sailors back to Lewis after the war, will also be marked. A total of 205 men died when it struck rocks near Stornoway. Mr Drummond said: "The dates recommended by the Scottish Commemorations Panel reflect the impact that the First World War had on Scotland. "As well as aligning with the UK commemorative programme these dates enable Scotland to remember the specific and significant contributions made by our servicemen and women and our local communities in very challenging times throughout the First World War and beyond." The Scottish government has already announced a £1m fund to help local communities refurbish war memorials, and a further £1m scheme to support visits by secondary school pupils to Western Front battlefields. RBLS chairman Robert Allan said: "Remembrance is at the heart of what we do and we believe it's vital to remember those who have made the ultimate sacrifice. "It's heartening that communities in Scotland will get the opportunity to remember the significant contributions made by our servicemen and women throughout the First World War and beyond with the programme of events announced by the first minister today. "To commemorate this period in our history RBLS will be launching a special campaign to capture the stories of veterans in Scotland and working closely with schools to help them learn about their local war memorials." Captain 'Winkle' Brown: Is he the greatest pilot ever?